“Each one of us has a link with the moon, a memory, a hope, a promise. The moon is us – a reflection of our humanity, our hopes, fears, and doubts,” says curator Alexia Fabre. H er latest exhibition is The Moon at the Grand Palais in Paris, one of two major exhibitions opening this April that will mark half a century since the Apollo missions in July 1969, when humans first walked the surface of the moon. 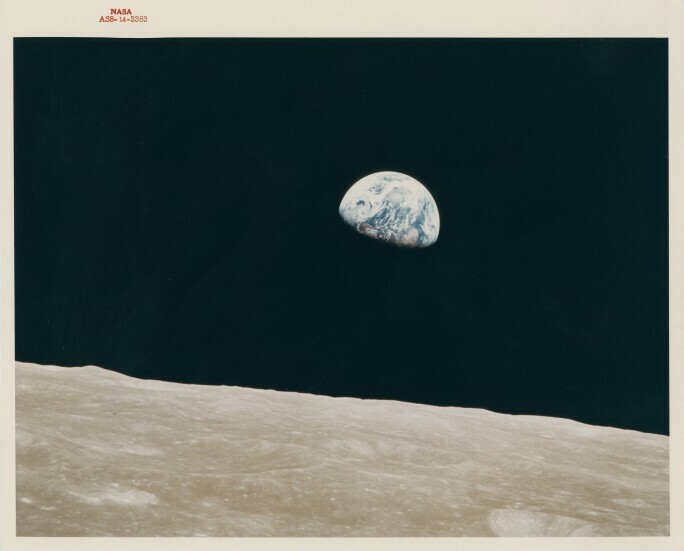 William Anders, First Earthrise seen by human eyes, Apollo 8, 24 December, 1968. Courtesy: collection Victor Martin-Malburet. Photo: NASA/Collection Victor Martin-Malburet. Copyright: William Anders. Our deep connection with the moon as a longstanding source of inspiration in art and culture will be the subject of many events around the world this year, including The Moon and Fly me to the Moon at Kunsthaus Zürich. Yinka Shonibare, Space Walk, 2002. Courtesy: Stephen Friedman Gallery, London. Photo: Yinka Shonibare MBE. Copyright: 2018 ProLitteris, Zurich. Both exhibitions will explore not just our relationship with the moon but also the interplay between the arts and science. In Zurich, curator Cathérine Hug has chosen the Romantic Age as a starting point, because, she says, “the moon developed into an overt motif in that period”. The show comprises eight rooms, featuring works ranging from Symbolist paintings by Edvard Munch to work by astronauts Alexey Leonov and Alan Bean. It ends with “the notion of the Blue Planet, how travelling to the moon made us aware of the fragility of our own Earth, which is a very current issue given the discussions about climate change”, she says. 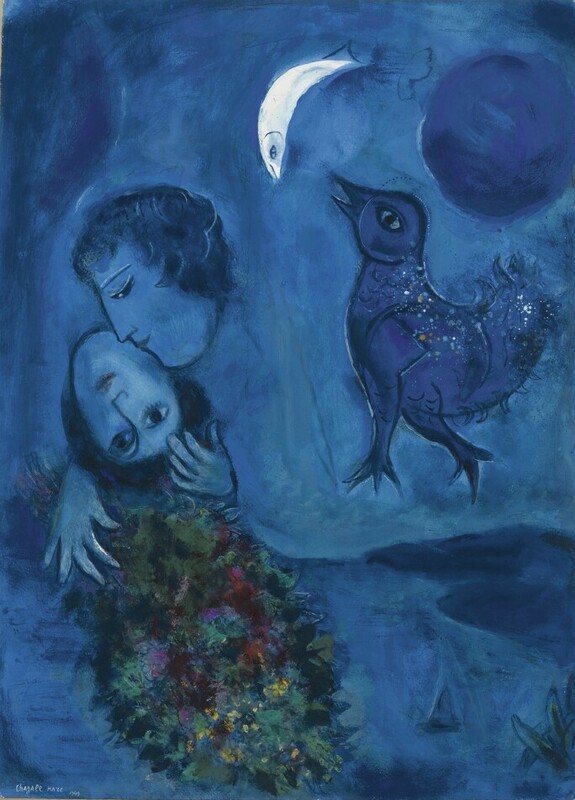 Marc Chagall, Le paysage bleu, 1949. Courtesy: Wuppertal, Von der Heydt Museum. Photo: VG Bild-Kunst, Bonn; Artwork: ARTOTHEK/Adagp, Paris 2019. Leonid Tishkov, Private Moon, 2003-2017. Courtesy: collection de l’artiste et RAM radioartemobile. 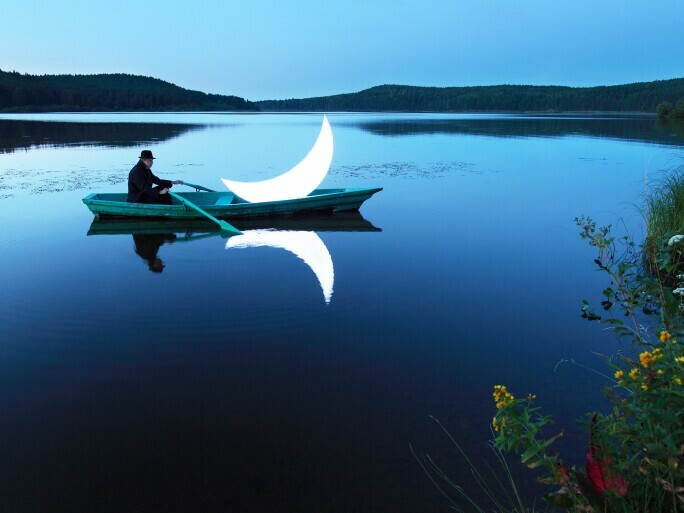 Photo: Léonid Tishkov. Sylvie Fleury, First Spaceship on Venus, 2018. Courtesy Galerie Thaddeus Ropac, London/Paris/Salzburg. Photo: Sylvie Fleury. There are elements of humour in both exhibitions, too, sometimes addressing serious issues. 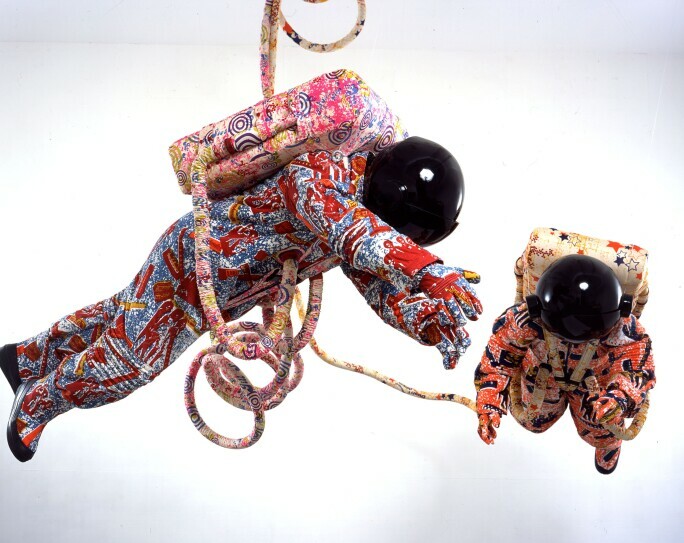 In Zurich, among the recent works on display is the 2002 installation Space Walk by Turner Prize winner Yinka Shonibare, depicting two astronauts in brightly patterned spacesuits hovering alongside a miniature replica of the Apollo 13 shuttle. 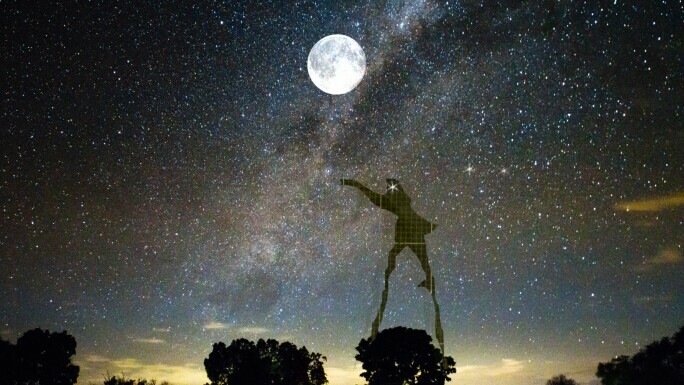 The artist playfully comments on the white-dominated quest for lunar hegemony and issues around colonisation; it is a work that raises, Hug says, “awareness about who has access to the technology to reach the moon”. 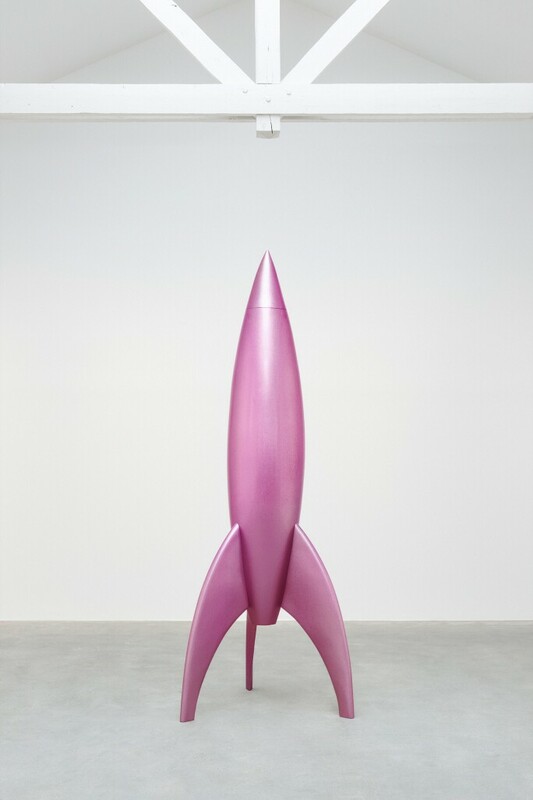 Meanwhile, Sylvie Fleury’s pink and furry space rockets are in both shows, and Marc Chagall's luminous Le paysage bleu, 1949, is a key work in the Paris exhibition, chosen by Fabre because it tells the story of the moon as a symbol of love. Pamela Phatsimo Sunstrum, To: The Moon, 2014. Photo: Pamela Phatsimo Sunstrum. Exhibitions such as these show that we can now recognise the long-term impact of reaching the moon on the human psyche. By examining how we imagined and depicted the moon in art through the centuries, we are perhaps both looking beyond our world and at ourselves.